This easy DIY lip scrub involves only THREE simple ingredients that you are guaranteed to already have in your kitchen. As the days grow colder, your lips will inevitably become drier. It is more important than ever to bring moisture and hydration back into your lips through exfoliation, and this easy and natural lip scrub recipe will do just the trick. Why Use A Lip Scrub? Exfoliating your lips before applying lip stick or any lip product is important for many reasons. It will allow the product to apply smoothly and the texture to coat evenly. 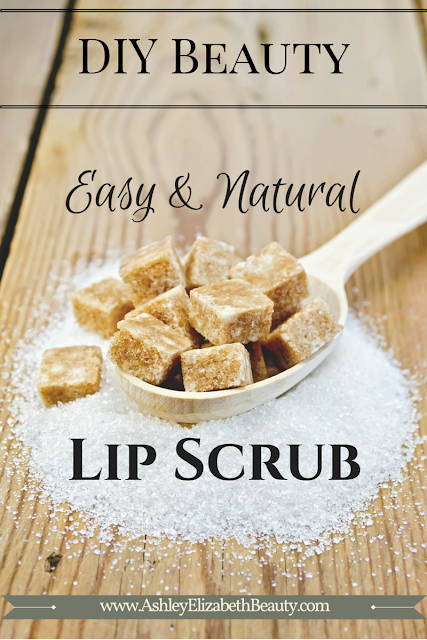 Using a lip scrub to exfoliate the top layer of skin will rid it of dead cells and then infuse hydration into your lips. Most of us do not have time to exfoliate our lips on a daily basis. In between using a lip scrub make sure you keep those lips soft and moisturized! During the cooler Fall and Winter months I find myself constantly reaching for any kind of hydrating lip balm. My favorite is Aquaphor Lip Repair, which includes Shea Butter and is free of fragrances, preservatives, and dyes. When searching for a good lip balm look for a product that is non-petroleum based, such as Shea Butter or Cocoa Butter. Mix all ingredients in a small bowl. Apply to lips with your fingers using small circular motions. Wipe off with a tissue or wet cloth to reveal soft, exfoliated lips. What great DIY projects have you found that are also great as gifts?